Another Saturday afternoon, another zombie movie in the multiplex. Shamefully, I've not seen George A Romero's original 1973 version of The Crazies, so I'm coming at this cold – albeit with 36 years of 'small town infected by mystery virus' movie history to compare it to. But given that Romero pretty much single-handedly invented the genre, it's good to see that, in the role of executive producer on this film, he's keeping it alive. Or should that be undead? Not really, no, because the 'zombies' in this film aren't undead at all, they've simply fall foul of a sinister, water-borne virus that turns them first into spaced out catatonics, and then cold-blooded murderers. And before you can say 'They're coming to get you, Barbra', the sleepy farming town of Ogden Marsh, Iowa, at first a deadringer for Lynchburg, Tennessee, could soon double for downtown Falluja. But as you'd expect from any escapee from the Romero stable, there's more to this film than blood-drenched killings and (slightly obvious) shocks. 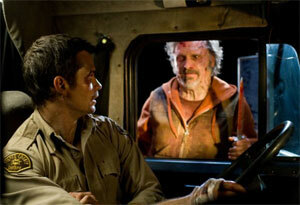 As our hero, Sheriff Dutton (Timothy Olyphant), his pregnant wife Judy (Radha Mitchell) and young deputy Russell Clank (Joe Anderson) struggle to avoid the virus and its rabid victims, plugging their neighbours as necessary, the army is moving in, containing the outbreak in the most extreme way possible. Who is the more sick, we wonder: the pitchfork-wielding local infected by a bug, or the trigger-happy hunter cleaning up the mess? Or the ruthless government cleaning up the mess through wide-scale slaughter? And who should you run away from first? The lovely Timothy Olyphant turns in a reliable performance as the small town sheriff thrown in way out of his depth and Radha Mitchell does her usual damsel in distress 'oh crap, I just shot someone' thang. 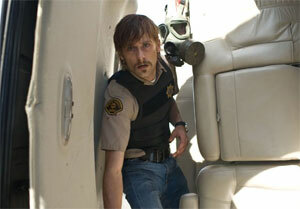 But it's Joe Anderson (disguised by a charming redneck moustache) who really steals the show as the sheriff's deputy driven to the edge by a desperate situation. A talented actor with big blue eyes and cheekbones to die for – when is this young man going to be a star? Sure, it does go on a bit, the plot has holes you could drive a truck through and the ending is predictably Romero-esque, but all in all The Crazies is a thoroughly enjoyable horror flick that's well worth catching.